Trying to make a quick buck on the side, AMD officially announced Radeon-branded DDR3 memory modules. 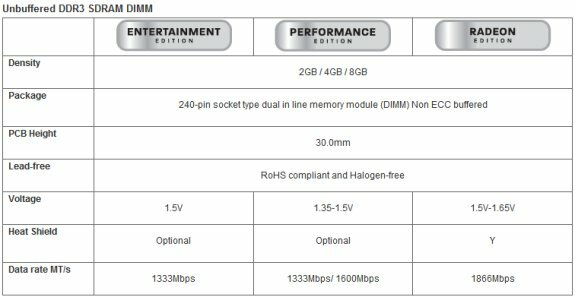 Rumors about these modules were published online a couple of months ago, and now the company has teamed up with Patriot Memory and VisionTek to market "AMD Memory". AMD (NYSE: AMD) today announced North American retail availability of the first AMD Memory branded desktop system memory modules, debuting with partners Patriot Memory LLC and VisionTek Products, LLC. AMD Memory branded products will help take the guesswork out of DRAM selection, providing an easy and straightforward experience when looking for the ideal match for gaming or multimedia PC needs. AMD is collaborating with memory module makers to create AMD Memory branded products from components qualified to meet certain specifications. By testing and certifying the memory components, end-users can be assured of compatibility with AMD platforms. AMD Memory is also designed to deliver quality and reliability with compatible chipsets and processors from other manufacturers. AMD Memory is coming to major retailers including Amazon.com, Bestbuy.ca, Fry’s, Memory Express, Micro Center, NCIX, Newegg, Tiger Direct, VIP Computers (UK) and others.